Batman Beyond is an animated television series produced by Warner Bros. and DC Comics. This version of Batman takes place in a futuristic Gotham City with a brand new batman, 17-year-old Terry McGinnis. Terry is a high school student who is at odds with his scientist dad, Warren. While Terry has had his share of mischief-making, he is improving his ways and believes in fighting against those who are wrong and bringing criminals to justice. While Terry is the Batman here, Bruce Wayne is still around and plays an important role: he mentors the young and inexperienced Terry as he goes on to become a superhero. Bruce Wayne had given up his role as Batman years ago after suffering a mild heart attack. Now very old, he lives as a recluse with only his dog, Ace, for company. The Batcave, which stores the new high-tech Batsuit, as well as those of Batgirl and Robin, has been shut down. Bruce and Terry meet when he helps Terry fight off the Jokerz, a group of gang members who style themselves after the Joker. Due to the struggle and his ailing heart, Bruce needs Terry's help to go back to his manor. There, Terry discovers the Batcave and Bruce's secret, only to be dismissed by a furious Bruce Wayne. The climax to Terry's becoming Batman occurs when his dad is murdered by the Jokerz. The main culprit behind the murder turns out to be Derek Powers, the CEO of Wayne-Powers. He had forcefully merged the two companies and was creating secret chemical weapons, which Warren figured out working for the company. Bruce refuses to listen to Terry and bring back the Batman, so Terry takes matters into his own hands and steals the Batsuit in order to bring Powers down. Bruce does not support Terry and wants his equipment returned, but Terry is just as adamant himself. In time, he manages to convince Bruce that Gotham needs Batman and wins over him. Bruce finally allows Terry to take up his former role as Batman and offers to help Terry with his crime fighting expertise. The Joker persuades wealthy heiress Baby Jane Towser to join him in his artistic capers. Aided by his new accomplice, the Joker easily clears out a wing of the Gotham City Museum to make room for his latest "masterpiece" - pieces of a broken table. But the laughing criminal has plans for the priceless collection of paintings that once filled the room. The Joker appears in an art gallery and defaces the paintings with paint-spraying guns. But instead of being horrified at his alterations, the Joker's work is praised as "art". After more success at an international art competition, the Joker founds his own art school. But Batman and Robin suspect he has a more sinister purpose in mind when he enrolls only wealthy millionaires. Though Batman escapes his watery trap, Robin is left in the hands of King Tut. The deluded villain still believes that Lisa Carson is really Queen Cleopatra, and calls Lisa's father to demand a ransom of $8,300,487.12, the mortgage on the Pyramids. Using the Jolly Jackson radio show to communicate, Tut negotiates the terms of payment with Batman. However, the villain most likely intends to keep both the money and Lisa, and has further plans to fry the Caped Crusaders in his royal boiling oil. After a blow to the head, Yale's Egyptology professor once again believes he is King Tut. He mistakes Bruce Wayne's friend Lisa for Queen Cleopatra, and kidnaps her so he can bring her to Egypt as his bride. Batman and Robin soon locate Tut's hideout, thanks to a hidden tracking device. But soon after entering, they are captured by Tut's cronies, and Batman is submerged in a sarcophagus under five feet of water. Catwoman is released from prison, and claiming she wants to enrich her education, enrolls at Gotham City University. She dresses one of her own henchmen as the Caped Crusader in order to frame him for a robbery. With Batman in jail, she goes ahead with her plan for a mass sit-in at Chimes Square. Catwoman is more than surprised when Batman himself shows up at the event. However, his efforts to expose the villainess are futile, and she prepares to terminate him and Robin in front of the whole crowd. The Joker is now Vice Chairman of the Gotham National Bank, due to an unsuccessful plan of Batman's. He installs his robots as tellers, and despite his criminal past, seems to be running things in perfect order. The Dynamic Duo realize they will have to trick him into making a mistake in order to remove him. They go to work on a plan to gain control of his robots. But that plan is jeopardized when, due to an odd turn of events, Batman's true identity Bruce Wayne is declared mentally ill and hauled off in a straight-jacket. Counterfeit money is being distributed by respectable citizens in Gotham City. Batman and Robin investigate, and find one of the Joker's lifelike robots substituting for a bank teller. They are certain who is behind the crime. But to get actual proof, Batman plans to visit the villain as Bruce Wayne and trick him into disclosing his operation. When his scheme suddenly backfires, it appears he will instead have to appoint the Joker as Vice Chairman of the Gotham National Bank. During a party for Batman's crime-fighting anniversary, the Riddler appears and nabs a golden calf filled with money for charity. His next target is the Gotham City Bank, which he floods for an underwater robbery. Although Batman and Robin try to stop him, the villain makes a clean getaway, leaving only a final riddle that stumps the Caped Crusaders. They discover all too late that his next move is an attempt to destroy them, this time with deadly quicksand disguised as strawberry icing atop a giant cake. Batman and Robin get back on the Penguin and Marsha, Queen of Diamonds', trail. Several escaped lizards lead them to the villains' hideout, where they find the stolen chain mail suits. Remembering an earlier clue from the Penguin, they head to the federal subtreasury to find that the Penguin, Marsha, and their cronies have broken into a vault containing ten million dollars in gold bullion. The Dynamic Duo shut the vault door on the criminals and try to prepare for every breakout scenario, but the Penguin has a daring plan of escape that no one could have counted on. Terry tells Max the tale of when his secret identity was almost discovered by the Kobra Organization, and how he endangered the life of a little boy by exposing it to him. While looking for his creator, Mad Stan becomes an alley to Zeta, then he betrays Zeta and turns Zeta into a walking Time Bomb, that only Batman and Ro can save. Terry must save Max, take down Kobra and stop a bomb that could destroy Gotham. While Terry goes farther into martial arts training, the evil kobra group move to Gotham. Charlie Big time returns causing trouble for Terry... in and out of costume. Batman and the other members of the JLU go after Superman, but Batman is a lone ranger when Starro takes control of the other members, so it's Batman against the JLU! Batman teams up with a mutated monkey who can talk to take down a poacher who killed Fingers's mother. Terry's old friend Charlie Big Time returns, and nobody but Terry will give him a chance because of his past. There is a new villan in town, the Reppelar, and he has some sort of connection to Bruce Wayne's company Wayne Powers, and Bruce and Terry want to know what it is. Paxton Powers is held hostage by the Royal Flush Gang, and he needs the help of Bruce Wayne, because nobody else will pay to have him released. 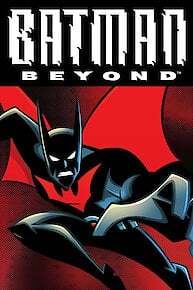 Batman Beyond is currently available to watch and stream on The WB. You can also buy, rent Batman Beyond on demand at Amazon, Vudu, DC Universe, FandangoNow, Google Play, iTunes online.